The New Summit Cabin is Under Construction! This past spring, we lost our Summit Warm-up Cabin due to a fire and we have started construction at the same site. There’s a lot of work to do in order to have the Cabin ready for the upcoming season and to also allow us time to trail clean. Here are some work-in-progress pictures of our dedicated volunteers in action building the replacement Summit Cabin. Great work! Looking good! The Annual Alberta Snowmobile Association Sled Show was a huge success for our club as well as the Golden Triangle. Lots of exposure to hundreds of sledders and lots of tickets sold on our Sled Raffle. Gerald House of Whitecourt was the winner of the Golden Triangle Mini Sled Giveaway, Congratulations Gerald! Thank you to the volunteers who helped at the booth throughout the weekend. The Whitecourt Trailblazers Snowmobile Club is pleased to announce that Alex Manweiler of Whitecourt received the highest honor award to snowmobile volunteers in Alberta. Alex was presented with the Louise Sherren Lifetime Achievement Award from the Alberta Snowmobile Association at the ASA awards ceremony at the Mayfield Inn on Saturday October 27, 2012 in Edmonton, AB. 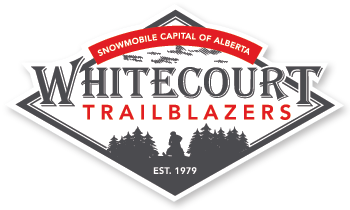 Alex has been involved in organized snowmobiling since 1979 when the Whitecourt Trailblazers Club was formed and was one of the founding members of the Club attending the very first Club organizational meeting in 1979. In the late 1980’s the concept of the Golden Triangle and a snowmobile trail link between the communities of Fox Creek, Swan Hills, and Whitecourt began to take shape. Alex was involved in this process. He was involved in scouting and signage for the Golden Triangle that then became part of the TransCanada Trail System. He also spearheaded the purchase of the Club’s original groomer in 2004 and along with Dale Gunderson, became the official groomer operator. In 2007, Alex was awarded the ASA Groomer of the Year. Alex is a great role model for other members of the Trailblazers and a great representative for the entire sport. He eats, sleeps, and breathes snowmobiling. On any given day throughout the year, Alex is volunteering for the Club. He has turned his retirement into volunteering for the Club and making snowmobiling in Whitecourt safer and more enjoyable for all to enjoy. The Manweiler Trail was opened in February 2011 to recognize Alex and Karen Manweiler and their contributions to the Club over the past 30 years.